The global rice information gateway aims to provide real-time crop information, medium-term supply and demand outlook, policy briefs, and comprehensive rice data sets at the national, subnational, and household level. 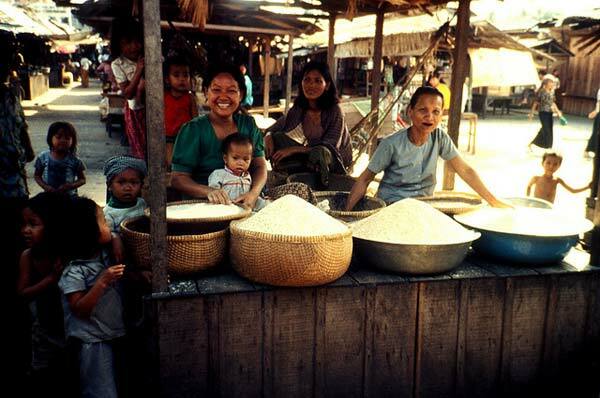 The farm household survey database is a collection of farm level data on rice productivity, fertilizer and pesticide use, labor inputs, prices, income, demographics, farm characteristics, and other related data on rice production in farmers' fields. This database provide solid, accurate data from an individual developing country to predict how specific population groups will be affected by changes nationally or internationally. Policymakers, commodity groups, and agribusiness organizations are increasingly interested in having a medium-term supply and demand outlook and knowing the impacts of expected or potential economic/trade, technological, and policy factors/trends for future policy planning and domestic food security. Assessment of domestic and trade policy reforms will also aid in harmonizing rice policies regionally and globally. These projections are expected to support government agencies, agribusiness, commodity groups, and others for their medium- to long-term planning. The rice monitoring and forecasting system for each country will be developed by combining modern techniques such as satellite-based remote sensing with weather and crop modeling, and econometric modeling. For medium-term market outlook and policy analysis, a comprehensive, state-of-the-art structural model describing the behavior of the world rice market and its linkage with other agricultural and nonagricultural inputs and products will be developed to analyze national and regional policy impacts on production, consumption, trade, and prices. Understanding geographic variation is an important aspect of agricultural research for development. As an integrative discipline, geography has particular strengths to maintain simultaneously in focus the technological, environmental, and socioeconomic aspects of agricultural development. In recent years, remote-sensing (RS) technology and geographic information systems (GIS) for spatial analysis have become widespread. These technologies can be used to monitor and evaluate agricultural systems to determine where and when rice is grown, as well as where crops are performing well or where they are not. Mapping and monitoring of the biophysical and socioeconomic characteristics of rice-producing areas is key for developing effective targeting strategies for the dissemination of new technologies and sustainable crop management and diversification options. Similarly, the identification of regions where there is an opportunity to expand the area of rice production is necessary as an input for policies that will deal with the growing demand for rice. 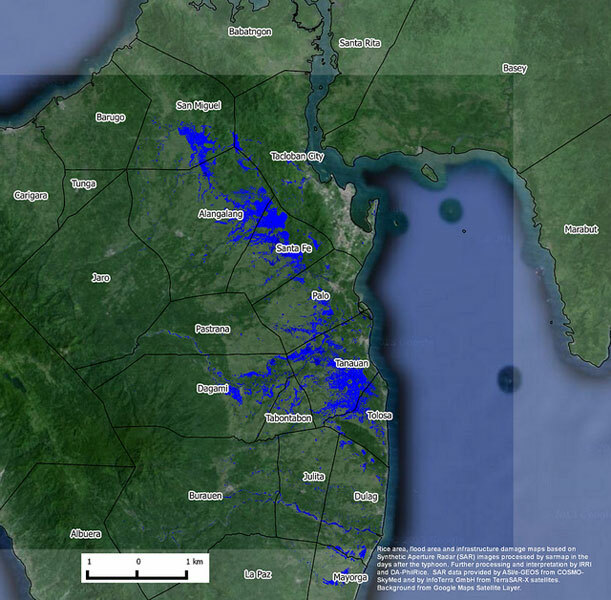 Moreover, by placing agricultural systems in the context of a river basin or at a national or regional level, the impact of existing and potential rice production areas on the environment, such as degrading water quality or water availability, can be assessed. Understanding geographic variation is an important aspect of agricultural research for development. As an integrative discipline, geography has particular strengths to maintain simultaneously in focus the technological, environmental, and socioeconomic aspects of agricultural development. Check out The RIICE project for more information. IRRI and partners use remote sensing imagery from satellites to generate information on the rice crop, such as planted area, seasonality, cropping intensity and damaged area due to flood or drought. Information on crop growth from such imagery can also be used in crop growth simulation models to estimate yield. In recent years we have been working with partners in the RIICE and PRISM projects to develop and test methods for mapping rice using Synthetic Aperture Radar (SAR) imagery. SAR is particularly suited to rice crop mapping and monitoring because of the unique temporal signature of lowland rice which can be extracted from multiple SAR images through the season. SAR systems can penetrate cloud, which is an additional factor in their favour since most rice in Asia is grown in the cloudy monsoon season. To date, our work has been limited to pilot or test sites due to both the complexity and cost of obtaining and processing SAR images. Due to a long standing collaboration with sarmap, the “complexity” part of the problem has been addressed through the development of automated processing chains which can be run locally or hosted on cloud computing facilities. The “cost” part of the problem also recently changed. The European Space Agency launched the Sentinel-1A satellite in 2014 and it will become a major source of SAR imagery from 2015 onwards, and will be joined in 2016/17 by Sentinel-1B. 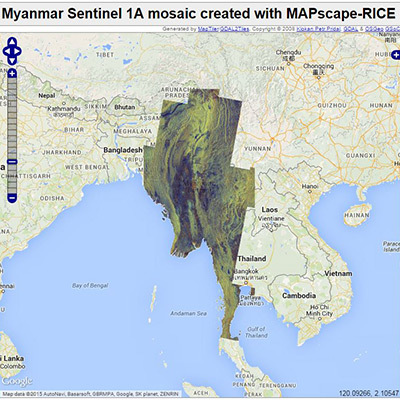 Sentinel-1 data is freely available and will cover many of the rice-growing areas of Asia with a spatial resolution of 20 metres. 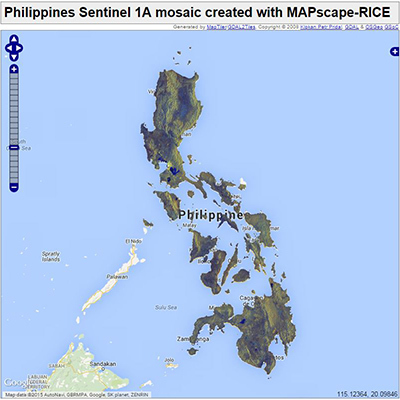 As a demonstration of the potential of the Sentinel program, sarmap and IRRI have generated mosaics composed from many Sentinel-1A images that cover 7 million square kilometers of South and South East Asia. 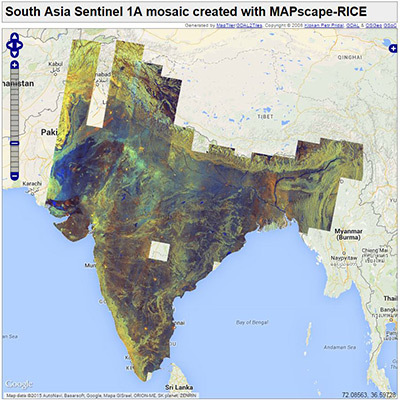 These cloud free mosaics show the value of SAR imagery for detailed monitoring of agriculture and natural resources across Asia. The mosaics are composed of images taken during February and March 2015. SAR imagery must be interpreted differently to imagery commonly seen in Google Maps and other mapping services. In these mosaics, we have processed images such that dark blue represents water or other flat surfaces such as airport runways, orange and white represent built up areas and human settlements, light blue represents bare soil, while brown and green show vegetation at different stages of growth. 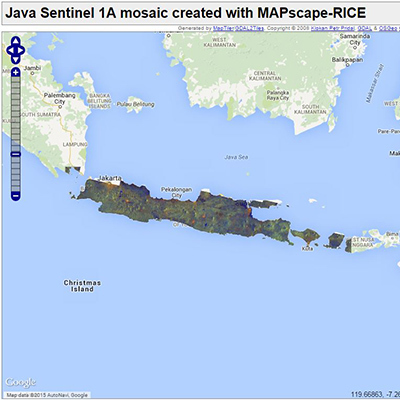 The mosaics are a snapshot of the earth’s surface, and have not been interpreted for rice mapping purposes. Sentinel-1A will continue to acquire images over the region, and these images will become increasingly useful as they reveal the progress of the rice crop over time, season after season. The ESA Sentinel program has a big role to play in the future of satellite-based remote sensing for rice crop applications. These mosaics are available for viewing as online maps or can be downloaded and viewed in Google Earth. Over the past five years, IRRI has been developing remote sensing-based maps of rice systems in Asia as part of our contribution to various projects that need good baseline data on the where, how, and when of rice. 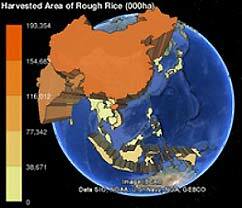 As much as possible IRRI aims to make its data available as global public goods. These provide access to the spatial data behind most of these maps as well as citations, documentation and contact points. 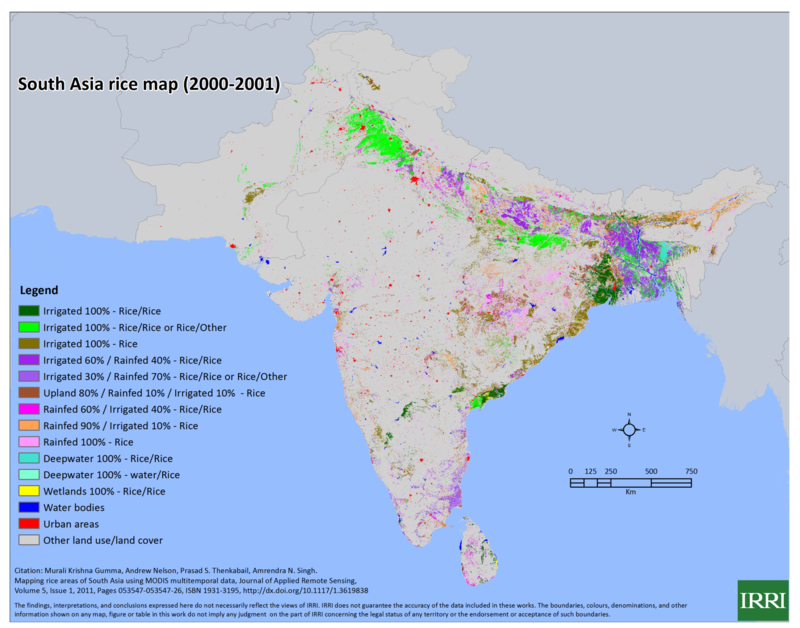 We continue to expand our rice mapping activities and plan to characterize the rice systems of countries in South East Asia in the coming years to complement the existing maps for South Asia. A good understanding of farmers' livelihood strategies, and how various factors such as policy, infrastructure, and institutions influence changes in livelihood strategies, are essential in underpinning technology development. 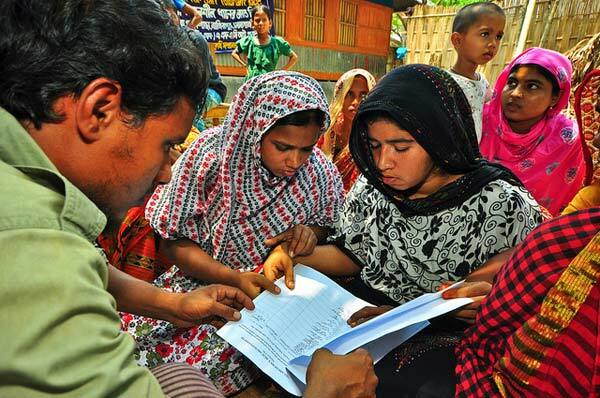 Livelihood strategies evolve with economic and social changes. It is within these changes that the suitability of various interventions (technology and policy) in generating the desired impact is determined. Similarly, long-term observation and analyses of changes in institutions and social contexts of rice farming are needed as such changes are generally gradual and slow. IRRI’s and its partners’ work generate knowledge and information to promote rapid adoption and diffusion of improved technologies and cropping systems designed for the needs of poor farmers, both male and female; and for identifying institutional and policy options. Data on household and farm characteristics, the resource base of households, labor use, income levels, farmers’ perceptions on technology needs, technology adoption patterns and constraints, and farm-level effects of technologies and management practices in rice-based cropping systems will be collected and analyzed. Such micro-level data will be disaggregated by gender for identifying the varying gender roles in ricebased farming systems and assessing the consequences of technologies and crop management and diversification options for women farmers. The data generated will be geo-referenced and will be analyzed through various qualitative and quantitative tools to derive the required feedback for researchers, research managers, and policymakers. IRRI and CGIAR advocate the inclusion of gender research in their scientific endeavors to distinguish the contributions of men and women in agricultural activities. They recognize the critical roles of gender in agricultural development and sustainability. Mainstreaming gender concerns in the various themes will build on the success of the earlier experiences of IRRI’s Women in Rice Farming Systems (WIRFS) program and sustained leadership in promoting gender equality in IRRI, Participatory Research and Gender Analysis (PRGA) led by CIAT and the African Women in Agricultural Research and Development (AWARD) of the Gender and Diversity program of the CGIAR. Capacity enhancement for women researchers, extension and development workers will build on IRRI’s experiences in conducting a leadership course for Asian and African Women in research, development and extension. The focal points on gender in GRiSP will also work with other international and national agricultural research institutions with expertise on gender audit, gender mainstreaming and on strategic research on gender issues.